There is a great difference between the English-speaking and continental worlds when it comes to the importance and prestige of holding a research degree. In 2011, The Economist reported that 114 members of the German Bundestag, 20%, held PhDs, including Angela Merkel, as against 18 members of the 112th Congress in the US, about 3%. In the UK, out of 650 MPs, in 2012 there were a total of 21 with PhDs - 9 Tories, 8 Labour, 2 Lib Dems, 1 Green, and 1 SNP, about 3.2% of the total. Russia is a country with codified law on the Napoleonic model. Its laws and legal system draw in particular from German models. On 13 January 1934, the Supreme Soviet of the USSR introduced the uchyonaya stepen or ‘stage of learning’ of Kandidat Nauk, [‘candidate of science’]. In Tsarist Russia there was a research degree named ‘candidate of the university.’ According to UNESCO’s International Standard Classification of Education (ISCED), the degree of Kandidat Nauk, which ‘requires public defence of an independently elaborated thesis and by final examinations’ is equivalent to a Western European PhD, and is recognised as such in the UK. As in Germany, the appeal and prestige of holding a research degree extends much wider than academe. Vladimir Putin has a research degree, Kandidat of Economic Science, which he defended in 1997. Putin was actually a lawyer, and graduated from Leningrad State University in 1975 with a degree in International Law. He joined the KGB on graduation, and served in the former German Democratic Republic from 1985 to 1990. He finally left the KGB in August 1991. Putin wrote and defended his dissertation at the Mining Institute in St Petersburg, where his supervisor was Vladimir Litvinenko, the Institute’s Director. Litvinenko later served as Putin’s St Petersburg campaign manager in the presidential elections in 2000 and 2004. In March 2006, Igor Danchenko and Clifford Gaddy, fellows at the Brookings Institute in Washington DC, published the results of their research on the authenticity of Putin’s dissertation. They had discovered that significant pieces of the theoretical chapter of Putin’s thesis, entitled ‘Strategic Planning of the Reproduction of the Mineral Resource Base of a Region under Conditions of the Formation of Market Relations’ were either copied verbatim or taken with slight modifications from the translation into Russian (prepared for the KGB) of the classic American textbook ‘Strategic Planning and Policy’ by William King and David Cleland. 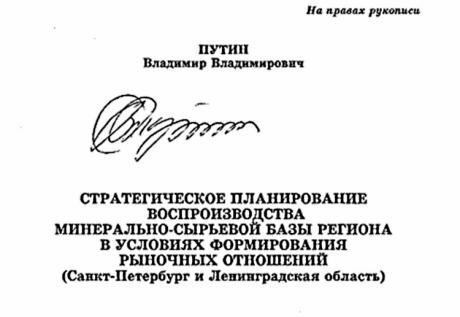 Front cover of Putin's dissertation, defended in 1997. Photo: Polit.ruDanchenko and Gaddy had considerable difficulty locating the dissertation, about which Putin has remained silent, but finally they did so, and subjected it to electronic searches. They found that there were more than 16 pages worth of text taken verbatim from King and Cleland. Also, there are at least six diagrams and tables lifted directly or slightly modified from King and Cleland, with no attribution whatever. Putin did not comment on these reports. In 2007, Mikhail Kirpichnikov, then head of the Russian Higher Attestation Commission (HAC, or VAK in Russian), responsible for the composition of the examining bodies (councils) established for each discipline, said that, starting in the early 1990s, the number of defended dissertations in Russia had dramatically increased, while their quality had drastically dropped. At the same time, the number of ‘purchased’ dissertations and ‘pseudo-scientific works’ had also increased. However, two things have changed this academic situation, with dramatic effect. The first is the wave of mass protests in Moscow and other cities from 2011, in which hundreds of thousands of educated Russian have expressed their fury at corruption in public life, and contempt for the democratic process by the Putin regime. Second, is the fact that all research dissertations are now placed on the internet, and are subject to scrutiny and investigation. In November 2012, a group of alumni of the Kolmogorov Centre at Moscow State University (MGU) noticed that the bibliography of the dissertation of the Centre’s director, Andrei Andriyanov, listed articles that were published in journal issues that did not exist. They also noticed that Andriyanov graduated from MGU’s Department of Chemistry, but his Kandidat dissertation was on history, entitled ‘Student Movement in the Social and Political Life of Moscow in 1991–2008.’ The dissertation contained text taken verbatim from various sources without indicating that they were quoted material. In February 2013, Andriyanov was deprived of his PhD, along with 10 other people. The next scandal concerned the dissertation of a parliamentary deputy of the ruling United Russia Party, Vladimir Burmatov. His dissertation, defended in 2006, was entitled ‘Formation of the Information Culture of Students in the Activities of the University Mass Media on the Basis of the Culturological Approach.’ A blogger, nicknamed Hyperhov, a creator of Idioteka journal which specializes in exposing pseudo-experts, investigated Burmatov’s dissertation and discovered that about 12 pages of text were taken verbatim from the dissertation of Lyubov Nesterova, entitled ‘Formation of Information Culture of Future Engineers of the Forest Industry in the Course of Humanitarian Studies’, and about seven pages were taken from an article by Alexander Fyodorov entitled ‘Specifics of Media Education of the Students in Pedagogical Universities’, published in Pedagogika journal in 2004. A physicist and blogger named Andrei Rostovtsev had already developed the Dissernet verification system. Using this system it was found that Burmatov’s dissertation was almost entirely copied from a work by Alexander Dragunov entitled ‘Formation of Political Culture of Future Journalists in Universities’ (2004). The main difference between the two was that the phrase ‘political culture’ used in Dragunov’s dissertation was replaced by the phrase ‘information culture’ in Burmatov’s work. 'Against falsifiers, fraudsters and liars' - Dissernet logo. Photo: dissernet.orgAs a result, three State Duma deputies asked the Prosecutor’s Office to investigate possible fraud. But in January 2013, the Ministry of Education issued an official reply stating that dissertations that were defended more than three years ago could not be subjected to such an investigation. Burmatov denied all allegations, but was obliged to resign his deputy chairmanship of the State Duma’s Education Committee. Also, upon the request of the Prosecutor’s Office, he had to resign from his position of professor at the Plekhanov School. In late February 2013, portions of the dissertation of Igor Lebedev, deputy speaker of the State Duma, member of the nationalist Liberal Democratic Party of Russia, and son of the party’s leader Vladimir Zhirinovsky, were found to have been plagiarised. Andrei Rostovtsev reported that Lebedev’s dissertation, entitled ‘Evolution of Ideological Bases and Strategies of the Parties of the Russian Federation in 1992–2003’, was to a large extent copied from the dissertation of Mikhail Kornev, entitled ‘Dominating Factors of Party-Building in Contemporary Russia,’ which was defended a year earlier. In early March 2014, I met Sergei Parkhomenko. He is 50 years old, was one of the founders in 1994 of the Moscow Charter of Journalists, and has published and held senior positions in many of the leading Russian critical newspapers, magazines, radio stations and websites. 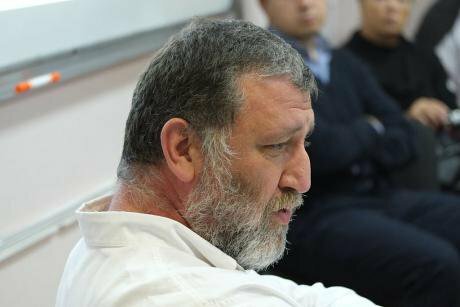 In March 2013, Parkhomenko published the results of another Dissernet investigation. This time, the subject was State Duma deputy and member of United Russia, Igor Igoshin. The main body of his text, entitled ‘Increasing Competitiveness of Enterprises on the Basis of Implementation of Their Market Potential (The Case of the Food Industry)’, was borrowed from the dissertation of Natalia Orlova, entitled ‘Market Potential as a Basis for Competitiveness of Confectionary Enterprises.’ But instead of examining chocolate as Orlova did, Igoshin focused on beef. As Parkhomenko noted, Igoshin ‘used imagination’ in replacing the relevant terms: ‘“Chocolate,” without any other indications, turned into “meat” in general. “Confectionary” became “meat-processing.” “White chocolate” became “Russian beef.” “Regular milk chocolate” became “imported beef.” Elegant “dark chocolate” turned into “bone-in beef of any origin.”’ By utilising ‘search and replace’ in someone else’s dissertation, Igoshin was awarded a Kandidat of Economic Science. Writing in The New Yorker in March 2013, Masha Lipman of the Moscow Carnegie Institute observed, ‘Lawmakers and other holders of fraudulent degrees presumably don’t even bother with the copy-and-pasting or batch replacement; they simply pay others to write their dissertations for them. But those hired to engage in a major falsehood can hardly be expected to be models of integrity. They are not the sort of ghost writers who do quality research that a lawmaker would put his name on; they steal.’ The difference between Germany and Russia, she continued, is that in Russia pervasive corruption is taken for granted, and one tends to be amused rather than shocked by the exposure of dissertation plagiarism and fraud. The scandal that hit the headlines in April 2013 concerned the dissertation of Pavel Astakhov, Children’s Ombudsman of the Russian Federation, entitled ‘Juridical Conflicts and Contemporary Forms of Their Resolutions (Theoretic and Legal Study).’ Parkhomenko published the results of a Dissernet investigation of Astakhov’s dissertation. Astakhov had combined a number of short texts borrowed from more than a dozen sources to produce his dissertation. On 28 January 2014, it was reported by the opposition web-site grani.ru, citing an examination carried out in September 2013 by the Russian State Library, that Pavel Astakhov’s dissertation was 99.32% copied from other sources. Excluding paraphrasing and text taken from his own master's thesis, 31.07% of Astakhov's dissertation was found to be copied verbatim. The Library subsequently denied that it had carried out such checks. Example of Dissernet research showing plagiarism in the dissertation of judge Dmitriy Gordeyuk, 2013. Photo: Dissernet Wiki By the end of 2013, Dissernet had examined over 700 dissertations, and ‘malevolent copypasting’ was discovered in about 300. All of these are to be found on the Dissernet.org site, with photographs of the ‘scholars’ concerned, and colour-coded web versions of their ‘dissertations’, showing exactly what was copied and from which sources. The authors of these dissertations are not only academics, but also government officials at regional and national level, judges, practising lawyers, and businessmen. Four more were exposed in May 2014. Lipman returned to the issue in the New Yorker in November 2013, under the headline ‘Heckling Russia’s J. Edgar Hoover.’ The previous week, Aleksandr Bastrykin, the head of Russia’s Investigative Committee, responsible, for example, for the prosecution of the Greenpeace ‘Arctic 30’ protesters, and close to Putin, was invited to take part in a conference in Paris on penal reform in Russia and France. Bastrykin lost his cool when questioned about plagiarism. ‘Wrongful appropriation’ had been thoroughly documented in Bastrykin’s work, not in a dissertation, in his case, but in a book published in 2004 entitled ‘Znaki Ruki. Daktiloskopiya’ (‘Signs of the Hand. Dactyloscopy’). Dissernet produced a chart showing how much of Bastrykin’s book had been ‘borrowed’ from other sources: illustrations, the table of contents, the title, and a preface accounted for about half of the book’s 370 pages. Of the rest, about 60 overlapped fully or significantly (with just a few words altered here and there) with Russian translations of two books: a German work on criminal science; and ‘Official and Confidential: The Secret Life of J. Edgar Hoover’, by Anthony Summers, an American, published in 1993 and translated into Russian in 2001. By the end of 2013, some of those exposed by Dissernet began to strike back. In December 2013, the Presnensky District Court of Moscow upheld a defamation claim filed by two Moscow judges against the opposition weekly, the New Times in respect of an article entitled ‘Plagiarists in robes’, and ordered the magazine to pay 1.1m roubles (£18,600) compensation. The judges were Moscow City Court judge Dmitry Gordeyuk and retired judge Yury Bespalov. Dissernet had shown that Judge Gordeyuk’s thesis had been plagiarized from his mentor Bespalov. The Court rejected a defence application for an independent expert evaluation of the dissertation. Minister of Education Dmitry Livanov admitted widespread plagiarism in dissertations by Russian officials. A similar claim was upheld by the Basmanny court against the opposition newspaper Novaya Gazeta for publishing an article entitled ‘Is it your plagiarism, your honour?’ However, lower damages were ordered. Again, the judge, Marina Tsyvkina, refused almost all the defence applications, including an application for inclusion in the court file of a copy of the dissertation. The paper’s appeal was dismissed by the notorious Moscow City Court. Dissernet is careful not to use the word ‘plagiarism;’ Parkhomenko and his colleagues use the phrase ‘incorrect borrowing.’ They emphasises that their investigations and reports are all carried out in strict accordance with Russian law. The results of electronic search and comparison are displayed objectively and in full, with minimal comment. Of course, Parkhomenko and his colleagues might use the phrase ‘incorrect borrowing,’ but everyone knows what they mean. Aggrieved subjects of Dissernet investigations not only have access to actions for defamation in civil law; after his re-election, President Putin reinstated the offence of ‘criminal libel,’ which had been abolished by former President Medvedev. The real problem, which Dissernet has identified, is the fact that most of the hundreds of ‘scholars’ whose details and ‘dissertations’ appear on the website really do not care about their exposure. They are not prosecuted, and most do not lose their jobs.